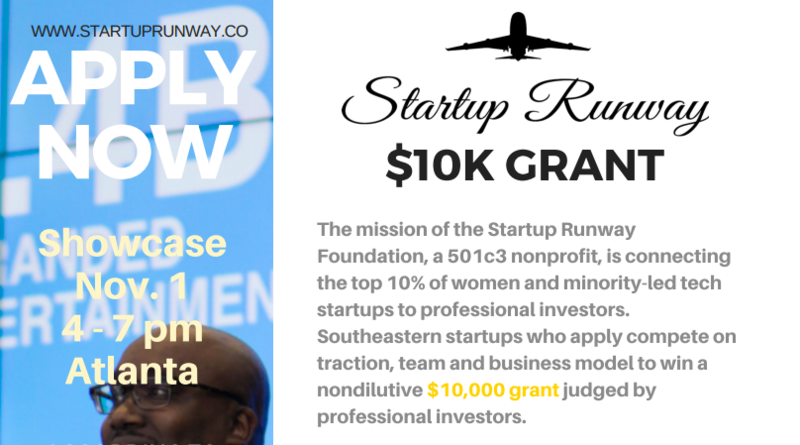 Thanks to our sponsors including Cox Enterprises, we’re thrilled the Startup Runway Foundation will present a $10,000 grant this November 1st. We need your help getting the word out about how to apply for the $10,000 grant. We’re looking for women- or minority-led software startups headquartered in the Southeast. Do you know someone? Do you advise or mentor an accelerator or incubator? Then please print out this flyer, get it up on the wall, and help the best startups meet seed capital at our Fall Showcase. See you there!